When I work outside (en plein air) I sometimes finish a painting and it is ready to frame and send to a gallery straight away, other times I am gathering information for larger studio paintings. I often paint outside, preferring to draw inspiration directly from my subject matter and try to bring some of that experience into my larger paintings. 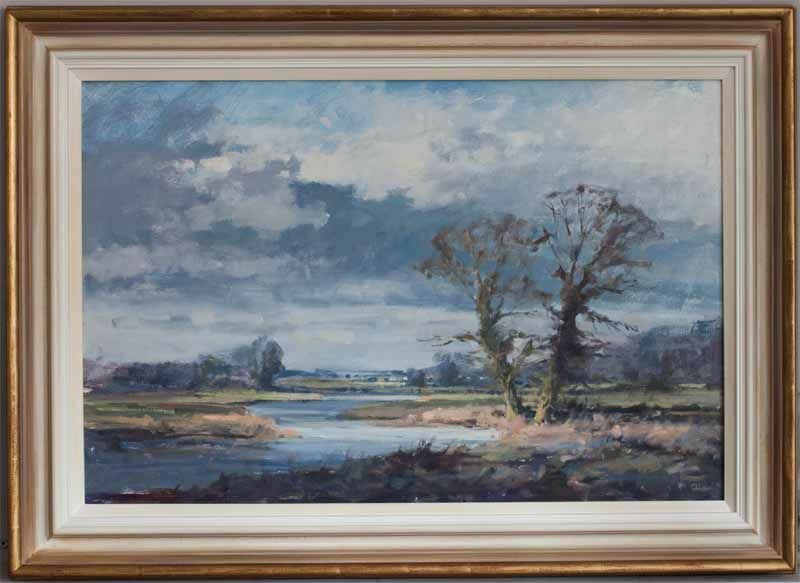 Here is the story of one painting's journey from field to frame. I made a short trip to Stratford St Mary this winter to paint the river Stour towards Dedham on the Essex Suffolk border in Constable Country. I had made a couple of trips previously with my focus on the church of Stratford St Mary and surrounding countryside. This time I took along my adapted Mabef paint box and worked on a number of small panels in oil. I had decided to work with just three colours; Ultramarine Blue, Cadmium Red and Cadmium Yellow together with Titanium White, this was for ease apart from anything else and to keep my kit lightweight for the trip. In my final painting however the church doesn't feature, in favour of a more atmospheric look at what the landscape of the Stour Valley has to offer. This was the painting that seemed to work best. I decided to make the trees the centre of interest with the little play of light on the base of the trunks as the focal point. Over about 45 minutes, the sun came in and out appearing briefly from behind clouds on what was quite a windy and fresh day. 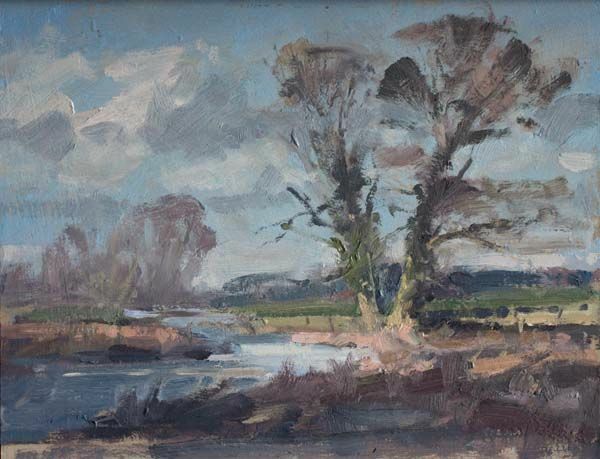 Choosing how to depict a landscape when painting plein air is part of the challenge. I could take my pick of light as the cloud shadows moved in from front to back like a torch over the landscape. As I was painting, I realised that the trees needed to be smartened up a little bit as the one on the right in particular wasn't very picturesque. I was particularly drawn to the long grasses and scrub on the river bank and the distant trees, the soft edges contrasting against the crisp shadow side of the tree was a nice variation. In order to make the composition more appealing, I decided to increase the size of the foreground trees a little to push the distance back and simplify the area around the trees to give them dominance. Working quickly means that you can focus on trying to get down the main aspects of a subject, the key things that first drew you to the scene. In this case, the colour of the sunlight hitting the trunks and of the long grass was key. When I returned to the studio I was pleased with what I had managed to capture and develop from the day. A few days passed and I realised that it had promise as a larger painting. I didn't take any photos on my painting trip so, as often happens, all I had was what I had painted on the day. It was from this small plein air study that I started considering a larger painting, first a 12in x 16in to help identify areas which may need more detail and finally on to a 20in x 30in painting. This final painting was originally worked up from the plein air study as a demonstration for a local art group. Once I had given the painting a little more thought I continued to developed it in the studio where I had more time to consider tones and colour harmonies. I enjoy working up landscape paintings in this way and being distanced from the original subject matter gives you a chance to draw from memory allowing the painting to develop under its own steam. I needed to put a little more detail into the background and I gave the trees more space as I wanted to produce an atmosphere painting rather than a tree study, especially at this size. I included an extra cloud shadow in the mid-ground which, in reality, would probably be the foreground shadow moving back through the landscape. A lot of the work in scaling up could be achieved by subtle changes in colour temperature, tone and brush strokes rather than actual detail. The end result gives a good impression of what first inspired me when I saw the subject and what I wanted to capture - the fleeting changes in light, muted winter colours together with the texture and grandeur of two old trees watching the world go by. River Landscape, Oil on board, 20in x 30in. This painting will be available from Thompson's Gallery, Aldeburgh, at the Annual Exhibition 2019, between 8 June - 7 July.